Image Armor Pretreatments are easy to apply either via our Aerosol Spray can or in liquid form using a spray gun or automated pretreatment system. Take your image clarity and details to the next level. 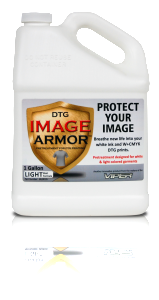 Superior image definition is easily achieved with Image Armor LIGHT that is unmatched in the industry. Improve the image color vibrancy. Reds are redder, blacks are blacker. The whole image looks so much better in an expanded gamut that is not absorbed by the garment. You can print 100% white or light colored polyesters and get sublimation like prints. Or print 50/50 and 100% cotton blends and still have all the benefits of Image Armor to improve your prints. Up until now, you really never had to pretreat white or light colored shirts if you were printing CMYK only designs (with no white under base). However, the colors were not that vibrant unless you printed a double pass, which wastes time and money. Even then, the results were only so-so. 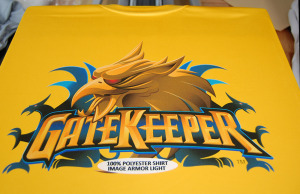 Image Armor LIGHT Shirt Formula creates a whole new dynamic for the DTG printing world giving multiple options in printing your designs, with incredible results. 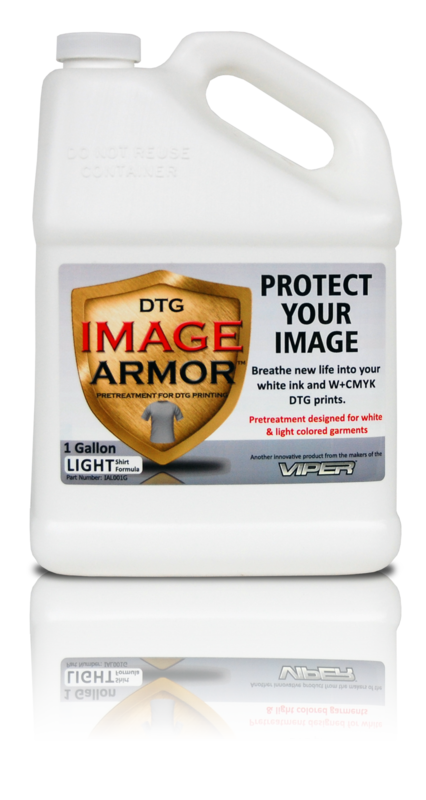 First, if you are NOT printing a white under base on your garments, Image Armor LIGHT will provide unparalleled image quality sharpness, vibrancy, and wash durability. Simply apply Image Armor LIGHT using a spray gun or automated pretreatment application machine (which is recommended for repeatable reults), dry and print. Also, most other pretreatments do not allow you to print only CMYK inks onto the garment. These pretreatments are made for printing a white under base and then your CMYK inks. However, if you do print a CMYK only print on one of these pretreatments the print will look great prior to washing, but when it is washed it will fade dramatically. Image Armor LIGHT Formula gives you the flexibility of printing a white under base on the garment and then printing your CMYK colors on top, while still giving incredible washability and performance capabilities. This allows for a variety of printing configurations including the ability to NOT print a white under base where the black ink is located. This results in using less white ink while still achieving incredible prints on the final garments. In addition these great characteristics, we've recently developed a method for allowing Dupont® ink users who WANT to print some LIGHT Colored 100% polyester shirts with white ink to do be able to achieve this "holy grail" of DTG printing. As you can see in the image to the right, printing 100% polyesters is possible though black and red (and some other darker colors) are still slightly out of reach. You can see how we did it on our 100% Polyester Printing Without Using Different Inks page. To the right is a video on why we believe that users will want to pretreat every shirt they print - even if the shirt is a white 100% cotton garment.